Asakusa-East-House is a Japanese-inspired house. We have a small Japanese garden, Japanese rooms and one of the bathrooms has a Mt.Fuji's painting on the wall. Also you can have the modern view like Tokyo-sky-tree from some of the rooms. ‘The Japanese room’is the raised tatami-floored seating area which is for welcomimg the important guest and it is inspired by Kinkakuji-temple in Kyoto and a Golden tea room loved by a prominent General. The Japanese garden is beautifully lit up at night. The Asakusa East house was an excellent value for our party of 8 (5 adults and 3 children). The floor plan, which includes 2 bedrooms, a bath, a kitchen and a livingroom on each of 2 floors, was perfect to allow for lots of opportunity for socializing, as well as for privacy when desired. 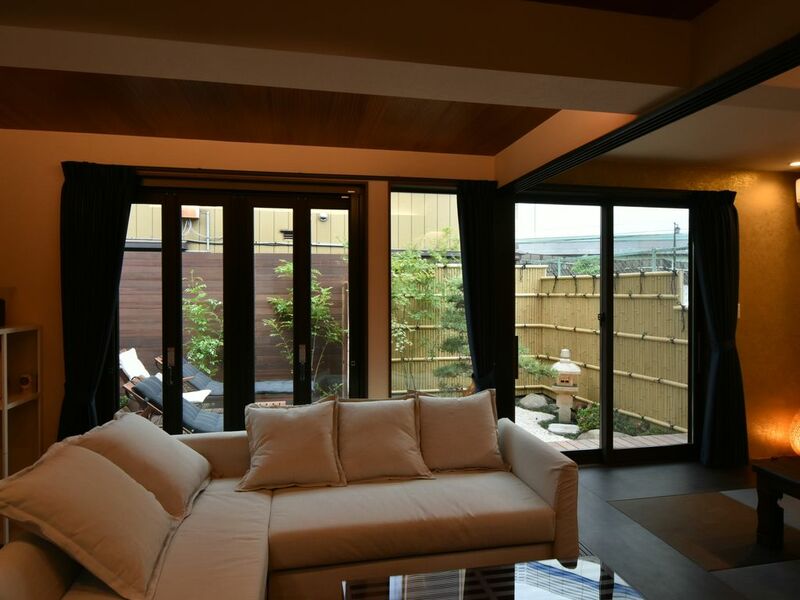 The design of the house is modern Japanese and comfortable and it is furnished with modern appliances. The host was very helpful in providing excellent directions for getting to the house from the train station, as well as in identifying restaurants in the surrounding area. The area in which the house is situated is residential and quiet with a neighborhood small but cute playground right outside of the house. I think having 18 people in the house, as advertised, would be possible but uncomfortable and it is not for people who want to be in the heart of a bustling area. Negotiating the train system is necessary in order to get to almost any tourist destination. It is, however, very quiet and relaxing. It was such a treat to find a two-story, stand alone home in Tokyo. It is on a direct line from Haneda airport and only one change from Narita airport with just a 2 minute walk to the house which was easy, even with large suitcases. Each floor is self-contained and there are 5 double beds in all with many options to sleep extras. So clean and well-appointed yet still felt quite traditional as there were slippers, lovely little outdoor gardens and tatami rooms. We'll stay again for sure - beats a hotel hands down! This house was simply amazing! On top of this house being comfy for our stay, the owner was very tentative in making sure we had everything. Hirotake promptly responded to all of our questions which was reassuring. The size of the house was perfect for our group, and the neighborhood is very quiet and relaxing. Every amenity was provided in this house. The proximity to the train allowed us to travel all around Tokyo in less than an hour! We hope to book this space again on our next visit. Best trip of our lives, which was made possible by the ease of renting this house!